Its time for a liquid eyeliner that is so precise, it is crazy-sharp. Introducing Razor Sharp Water-Resistant Longwear Liquid Eyeliner by Urban Decay, an intensely pigmented liquid liner that lasts all day and comes in everything from lacquered creams to metallic shimmers. This water-resistant formula dries down quickly, provides long-lasting wear and will not smudge. 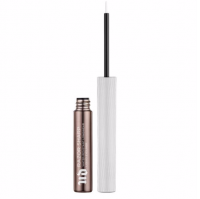 And the fine-tipped brush applicator lets you lay down sharp liquid lines draw them super thin or thick and bold, or even spot-reapply with ease. Plus, Razor Sharp comes off easily with makeup remover for no-fuss removal (and no raccoon eyes!). With Razor Sharp, Urban Decay has expanded its range of liquid liner, adding more dimensional colour and multiple finishes. There is something for everyone from colour junkies to fans of neutrals. If you can never get enough colour, you will want to experiment with Chaos (a bold, bright blue that really stands out), Zodiac (a dark, sparkly blue-green with a cool shifty effect), Kush (an extremely addictive bright green) and Goldrush (it is like liquid gold!). Gone are the days of struggling to find the right shade in your bag! 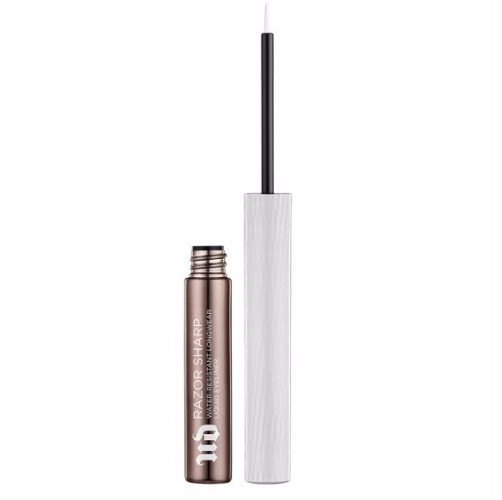 Razor Sharp Liquid Eyeliner comes in a highly metallized bottle with an easy-to-spot, shade-matched cap. To create texture and added grip for the perfect application, the bottle features microfine slashed knurling in a pretty crosshatch pattern.